Janet Napolitano, President of the University of California, said the university is "in a state of excitement" after closing a multi-year budget deal with Governor Jerry Brown last Spring and that she now wants to "ratchet down' student fees amid the rise of student debt. 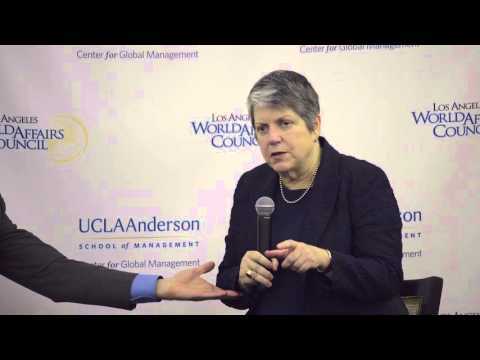 Speaking to a LAWAC dinner on February 3rd, Napolitano said that to convince Governor Brown to allocate more funds, she told him "California would not be California without the UC system." As former Secretary of Homeland Security, Napolitano also talked about her thoughts on the current state of national security saying she believes we are better off than we were pre-9/11, but that there is deep concern for the increase in cyber threats and an ongoing concern about aviation security. Maureen Dowd on "The Year of Voting Dangerously"
Dowd has covered Donald Trump and Hillary Clinton since the 1990s. She was with the real estate mogul when he shyly approached his first Presidential rope line in 1999. She won a Pulitzer prize that same year for her penetrating columns on Bill Clinton's impeachment follies. In this perilous campaign season, The New York Times columnist traces the psychologies and pathologies in one of the nastiest and most significant presidential campaign battles ever. Trapped between two candidates with the highest recorded unfavorables in US electoral history, Americans are plunged into "the year of voting dangerously." There is nobody better than Maureen Dowd, the New York Times columnist, to skewer the shortcomings of each of these candidates with her perceptive reporting skills and acerbic sense of humor. 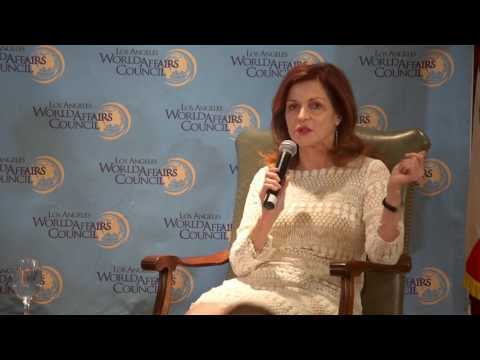 Dowd spoke at a Los Angeles World Affairs Council luncheon on September 23rd on her past experience with both candidates, and what type of presidency we might expect from each one as they vie to win the White House. Frank Gehry, after nearly six decades working as an architect, said he would like his legacy to be "transmitting feelings through materials." 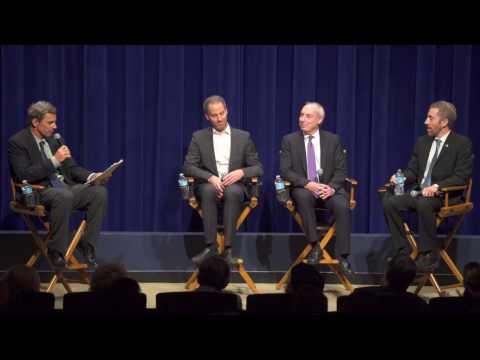 Gehry spoke to the Los Angeles World Affairs Council on Wednesday, March 2 at the Los Angeles County Museum of Art where there is currently a retrospective exhibition of his work. Gehry said completing Walt Disney Concert Hall was a "rough one" and that when the design for the Guggenheim Museum in Bilbao was first revealed his life was threatened. After celebrating his 87th birthday last weekend, he said he is spending a lot of his time on the LA River project which he describes as a "very dense problem and a very exciting prospect." 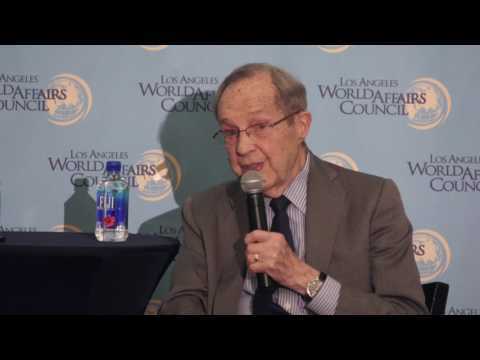 This is a clip from Dr. William J. Perry's address at a LAWAC dinner. 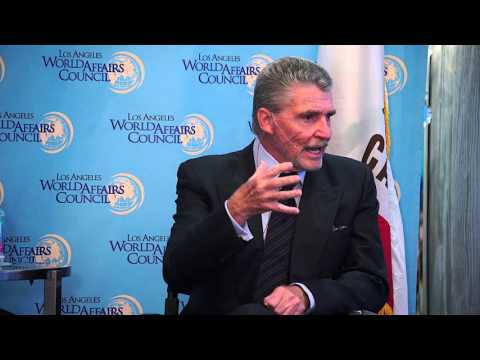 Dr. Perry was the 19th U.S. Secretary of Defense. 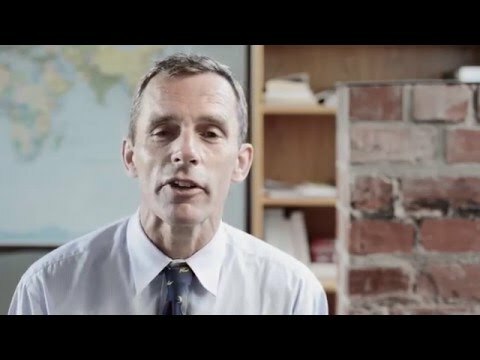 Find out more about Dr. Perry at www.wjperryproject.org. 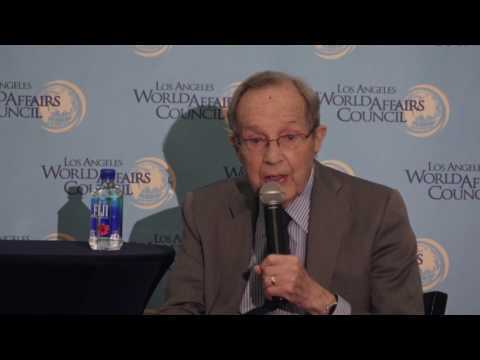 Dr. William J. Perry on "Nuclear Threats in a Chaotic World"
Dr. William J. Perry was the 19th U.S. Secretary of Defense. 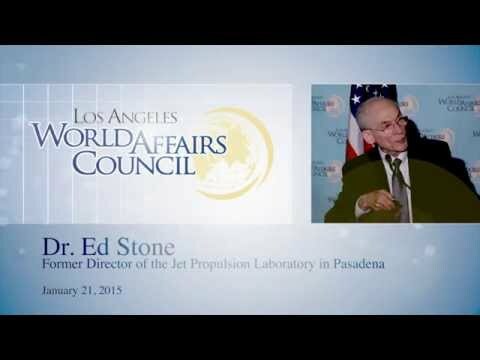 He spoke to a LAWAC dinner about why nuclear threats are greater today than they were during the Cold War. To learn more about Dr. Perry visit www.wjperryproject.org. 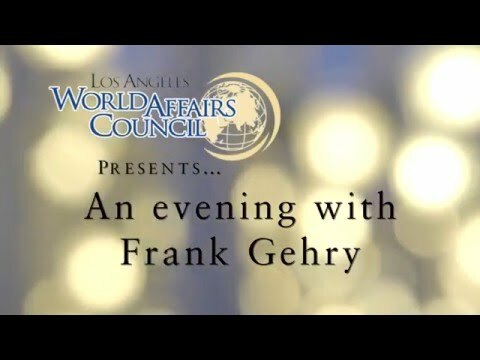 As President Trump closed in on his first 100 days with a timely announcement about a plan to drastically cut taxes, the LA World Affairs Council hosted a panel discussion on Tuesday, May 2nd, with a former adviser to Hillary Clinton, Josh Lockman, senior Breitbart editor, Joel Pollak, and a political pollster, Dan Schnur, who all have very different views of Trump and his policies – reflecting the diversity of opinion nation-wide on the 45th President.